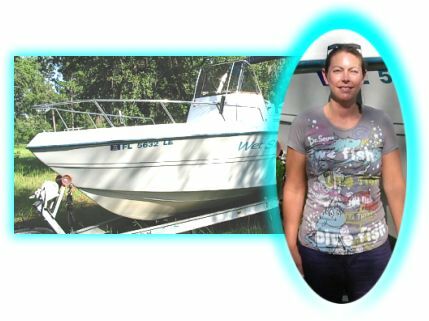 Catalina Custom was contacted by James and Rhonda Keiper of Wesley Chapel, Fl to construct the seating upholstery for this nice 22' Pro Sports center console boat. The Pro Sports had no upholstery at all to start with. 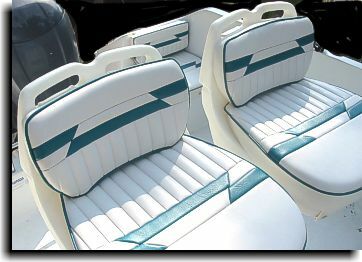 Catalina Custom had to make all patterns for the upholstery. 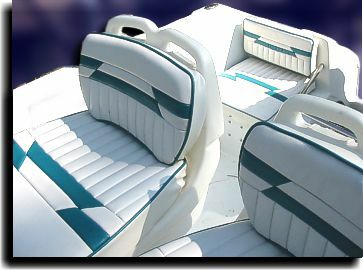 Also, the owners left the facing design of the upholstery to Catalina Custom. 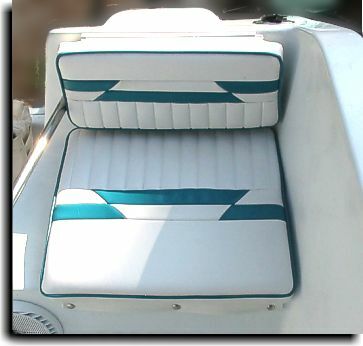 Using a combination of white quilted vinyl, teal vinyl for facing accent stripes and welting - that matched lettering on the side of the boat and the Bimini top - and triming in a white vinyl, this is one of the nicest jobs done by Catalina Custom and the owners have a interior to be proud of and get good service for years to come. All materials used in this project had marine quality specifications. Mildew resistant foam and vinyl with polyester UVR (ultra-violet ray processed) thread to stand up to the harsh marine enviorment. Also, the vinyl facing is UVR treated to help keep the soft hand and color. This job consisted of all upholstery being covered on foam pads. With this application, special considerations were employed when constructing the covers for water extraction and keeping the water out of the foam pads as much as possible. 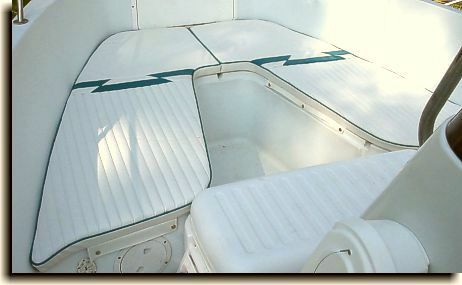 All foam was wrapped in silk film (thin plastic) and a vinyl mesh was utilized on the bottom of the cushions and pads to let the water get out of the covers. 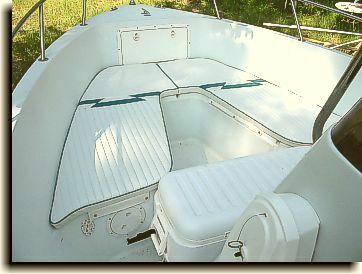 With this in mind, only marine quaility zippers was used in the vinyl mesh. The main seating for the driver and passenger had to have all new foam patterned for proper size. 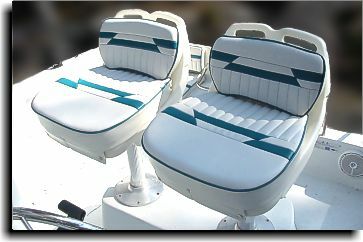 The foam on the bottom of the cushions had to be built to fit the conforms of the hard cushion seats. 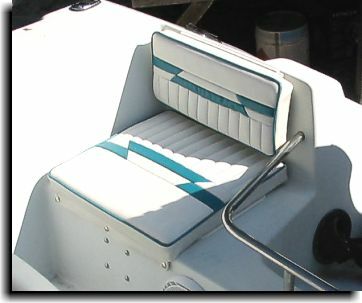 The structure and combination on how these seat facings are designed (how the quilted vinyl is connected to the teal / white accent stripes and then connected to the plain white vinyl) was carefully continued from the aft seating to the bow cushion pads. 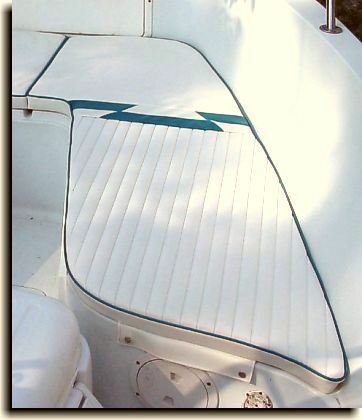 Bow seating cushion pads with the enhanced facing design. The patterns for these pads had to have special considerations when cutting the new foam to make sure the foam fit properly with the angle of the bow walls.